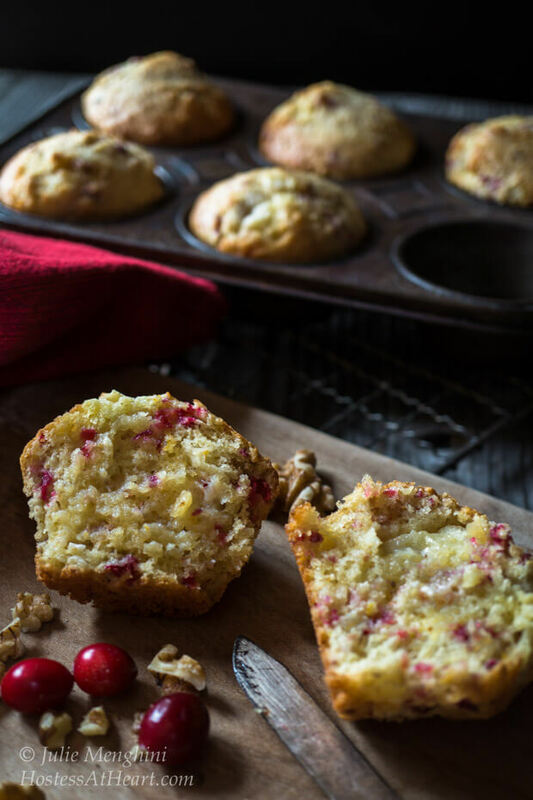 Soft and buttery Cranberry Orange muffins that are quick and easy. 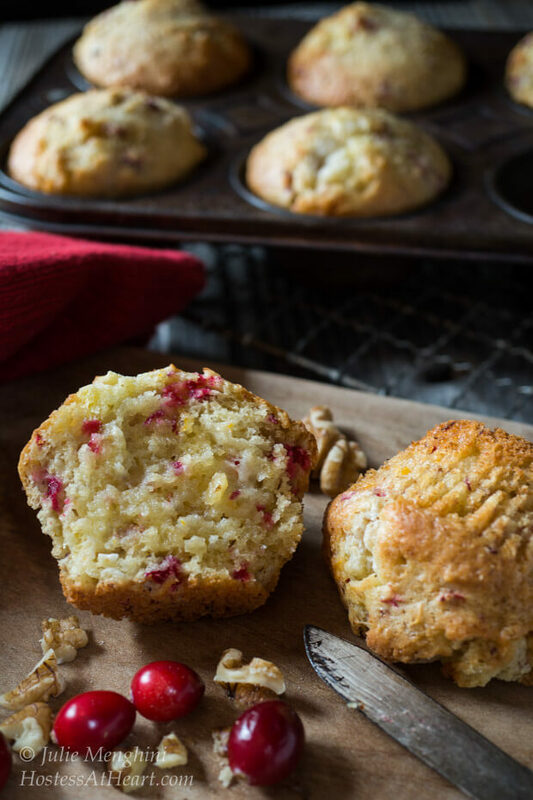 This muffin is perfect for breakfast, brunch, or anytime! Baking bread for the Holidays is such a special thing for me. When I think about a holiday bread, I am not going fruitcake. It’s good for a nanosecond and then I am over it. No, I want soft and buttery Cranberry Orange Muffins. These muffins are just as good for breakfast as they are with my Thanksgiving turkey or Christmas goose. O.k. I have never had a Christmas goose, but you get the idea. I found this recipe baked as a beautiful loaf of cranberry walnut bread. However, I knew that we wouldn’t be able to get through all of it before it was no longer edible. I turned it into muffins. Muffins are wonderful for breakfast or brunch, and they can be put in the freezer and taken out as you need them. I love making them for company because they’re just a special treat that says you appreciate the people at your table. One of the things that I have learned about making muffins is that they turn out better if I mix them by hand. Over mixed bakery can be tough, or you can have little tunnels throughout the crumb. That’s from over mixing. This recipe called for butter, cut into small pieces and then stirred into the dry ingredients. I treated this like I do my pie crust. I cut my butter into pea-sized pieces, and then just dropped them into my dry ingredients, coating them, not blending it in. The wet ingredients are stirred only until they are incorporated, and I gently folded my orange and cranberries into the batter. Heavens people, these muffins are buttery soft and delicious. 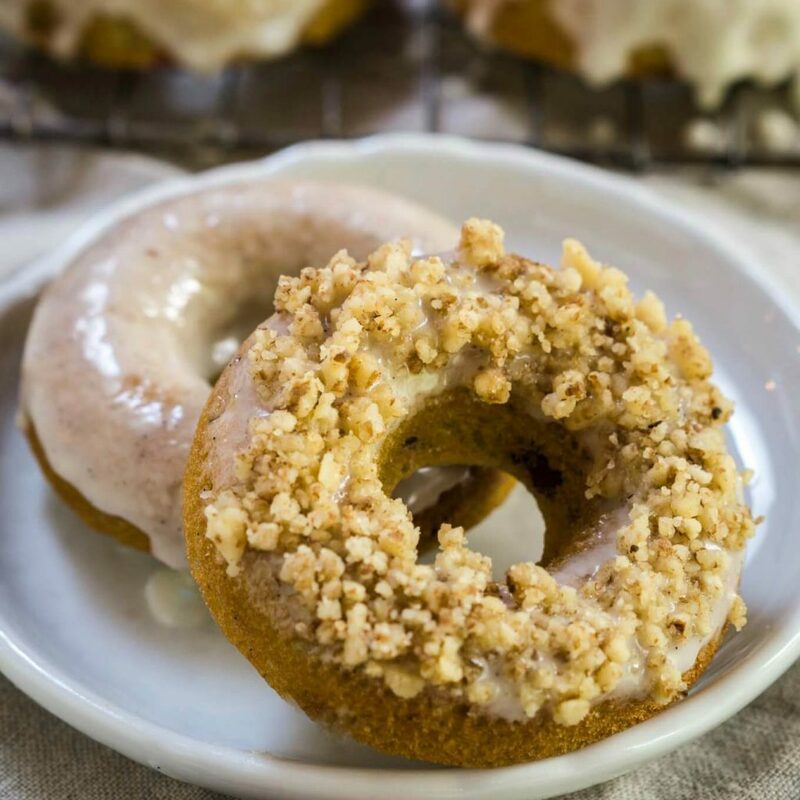 They are perfect for breakfast, brunch or any occasion. Take them to work over the holidays and you may get a raise! Freeze them and pull them out when you want a special treat. 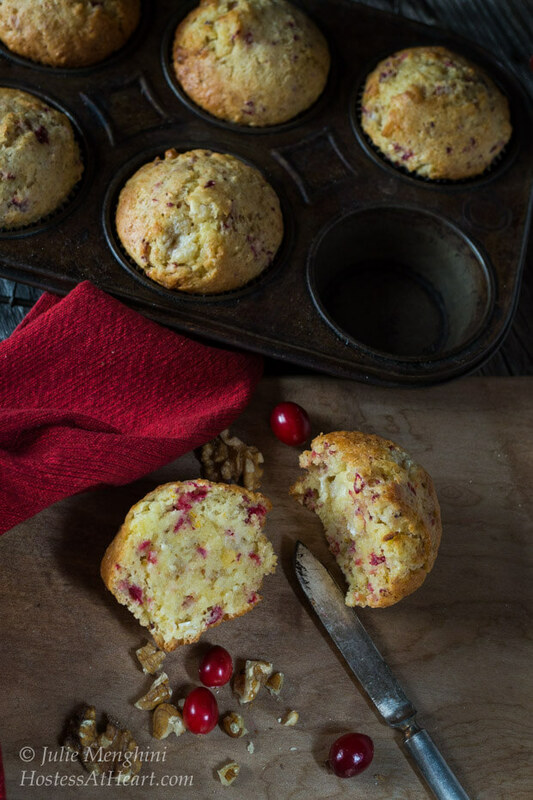 A soft and buttery Cranberry Orange muffin that is quick and easy. This muffin is perfect for breakfast, brunch or for any occasion. Preheat oven to 375 degrees F. Line or grease a muffin tin. Combine flour, sugar, baking powder, salt and baking soda in a large bowl. Whisk ingredients together. Drop butter into dry ingredients, and lightly stir to coat. Add orange juice, zest, and egg. Mix until just combined Fold in cranberries and walnuts. Bake at 375 degrees F for 25 minutes or until a toothpick inserted comes out clean. Store covered, or freeze in a reclosable plastic bag. Alternately, Bread can be baked as a loaf in an 8 1/2x 4 1/2 pan. Bake at 350 degrees F for 60 to 75 minutes until a toothpick inserted comes out clean. Cool 10 minutes and then remove to cool completely on a wire rack. Thank you Christine! 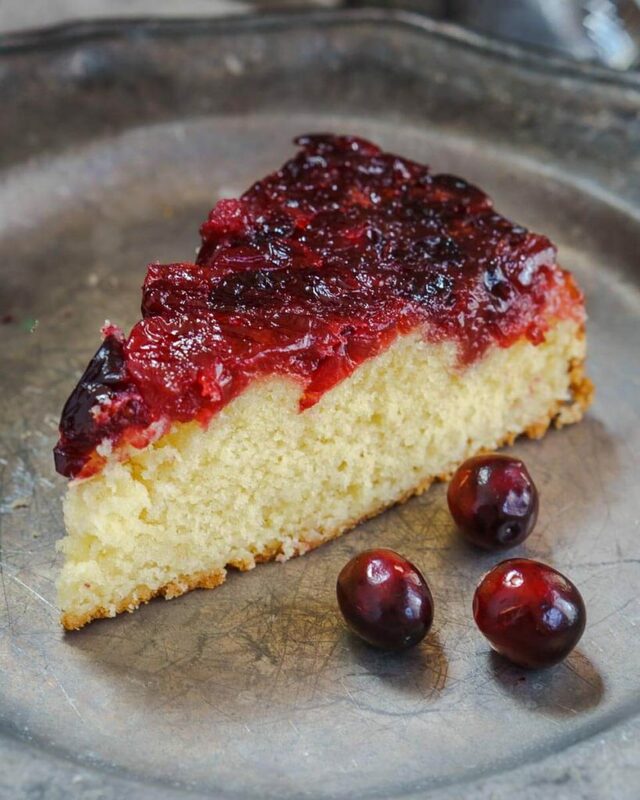 Give those cranberries another try! P.S. Your pictures are so pretty! Thank you! I must admit that I was pretty excited about it too. I think the following day I couldn’t get a single good pic. There are days…. These look like they would just melt in your mouth! I love the combination of flavors. They would be perfect for Christmas morning. Thanks for sharing them, Julie, and also the tips for not overstirring. Thank you Shari! I always read about not over mixing, but I learned in my bread class that the worm tunnels are from over mixing. These muffins would absolutely be perfect for Xmas morning! Hi Julie, the combination of cranberries and orange is so delicious. I think I saw that bread recipe as well and wondered if it would make good muffins. Thanks for bringing them to FF. I would love one with a cup of tea. Thank you Liz! They are so delicious. Thank you for hosting this week! Hope the remodel is going well! Delicious looking muffins Julie, I love the sound of cranberries with the walnuts. 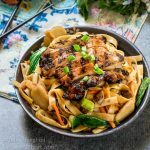 I’ve pinned to make later. Thanks for sharing. Thank you Sarah! They are really becoming my favorite muffins. Thank you so much! I think these are easily my favorite muffin right now. 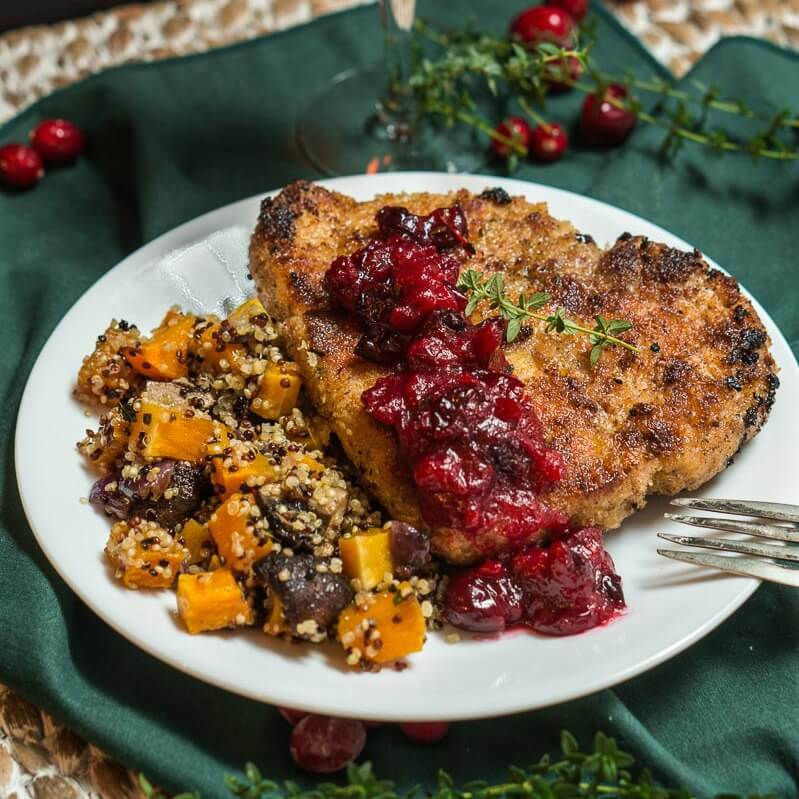 Orange and cranberry is such a classically delicious holiday combination. I really love that you can see all the flavors in the muffins that have been split in half. Just gorgeous! Thank you so much! I think these muffins are easily my favorite. Thank you Ana! Hope you had a wonderful Thanksgiving! How interesting to hAve the butter cut in dice for moistness. Love orange and cranberry together and must make these! If I wasn’t so busy up to my elbows in flour baking yesterday for a breakfast meeting this morning, I would have read this and made them already!!! Thank you Johanne! I think these have to be my favorite muffins of all time. It is getting crazy isn’t it! I think that muffins are just so very lovely! I know what you mean about not finishing the loaf. It’s so nice to even freeze some of the muffins and enjoy at a later date as a special breakfast treat. A perfect holiday muffin, Julie! Thank you Lora! So many wonderful picks on #Twelveloaves today! Your photos are so beautiful and inviting. 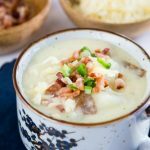 I love this flavor combination and will definitely have to try the recipe soon. I usually try and take some baked goods into work every now and again, but I’m sure these would be all gone before I could even think of pacing them up. Thank you Felice! The folks at work would love them. I send treats in with my husband too and they always gobble them up. You make such pretty things, Julie. I like making muffins. They might be the closest thing to instant gratification in the bread-making world. Thank you Patti! These are just so yummy, and I sure looked forward to having one at breakfast! Thank you Anna! They only made 12 muffins so please hide a couple for yourself. The loaf is gorgeous too. Please let me know what you think. What a coincidence, I just made those this afternoon and they look just like they came out of my oven. Only difference, I do not add the walnuts as you list as optional. We both had a great treat! I don’t always add nuts because my hubby doesn’t always love them, but we sure enjoyed this combo. These muffins sound so good. your description makes them sound mouth watering! yumm I love the ingredients Julie! Thank you so much Lynz! They are some of the best muffins I’ve ever eaten! 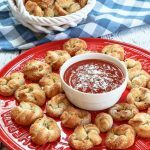 These do look and sound delicious! The photos are amazing too! I love this dark and moody look. Thank you Karen! I’m drawn to it too. Gorgeous muffins, I made a similar loaf last year with cranberries and orange peel/juice, just delicious! Yours look beautifully moist. I also like the dramatic effect of your pictures, from darkness to light featuring the muffins. Thank you Loretta! 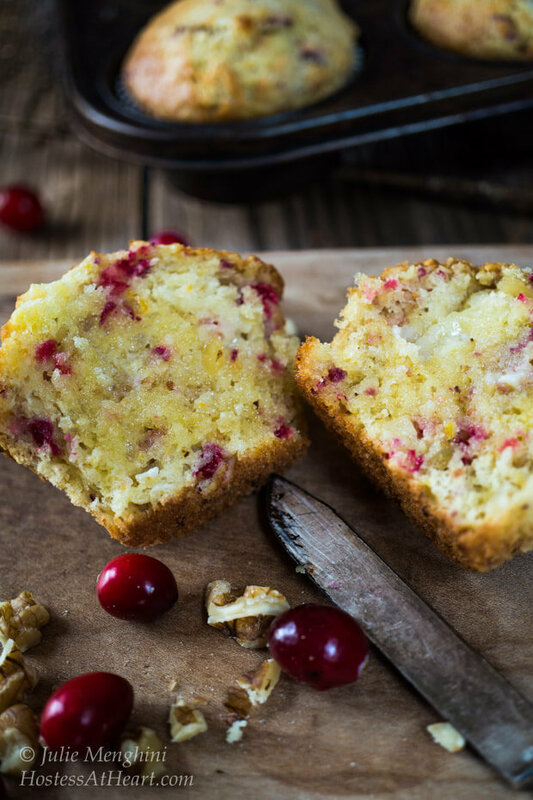 I have just been craving cranberry orange bread, and enjoyed them for breakfast! It’s been cloudy here for the last 2 to 3 weeks. Not uncommon, and it makes taking pictures a bit easier. 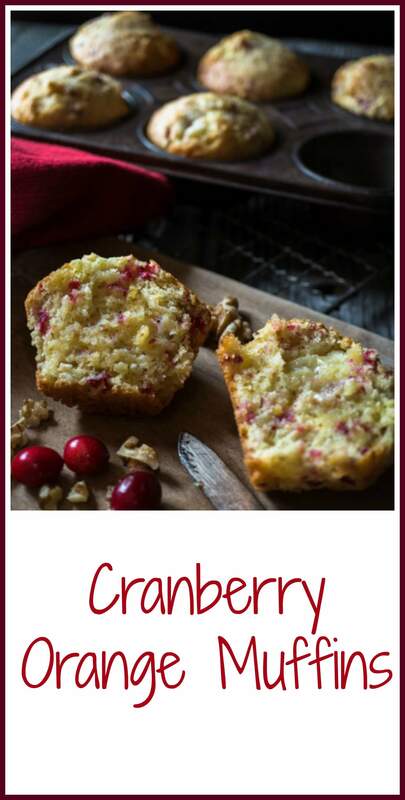 Great holiday muffin for any meal, love the cranberry and orange combo. And now I want Christmas goose! Ha! Goose for everyone! Thank you Evelyne! Those muffins look so good Julie, what would you think about using leftover whole berry cranberry sauce. I make it with fresh orange juice, do you think I would have to adjust anything? Sounds delicious Suzanne. I think if yu use the cranberry sauce that you might want to reduce the orange juice just a bit to compensate for the extra liquid in the sauce? You bet! I hope you’ll let me know if you give it a try. Would make a great post? Yes it would and I will definitely give a try and link to you. I am intrigued by your technique not creaming the butter bit adding in small pieces to the muffins. 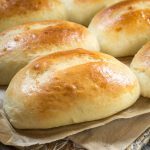 It worked, and they were soft, moist and buttery! Wow, these look incredibly moist and delicious! Love cranberry and orange together! Thank you Jenn! They are just delicious. I love that combo too! Thank you Judi! These are just delicious! Very bright and flavorful. Let me know what you think!